CRIME, GUNS, AND VIDEOTAPE: Springfield Armory’s Little Gem, the XDS .45 ACP Sub Compact! Springfield Armory’s Little Gem, the XDS .45 ACP Sub Compact! Las Vegas, NV—I’ve never been a fan of polymer frame guns. It’s more because of the sensitive triggers and my fear of an unintended discharge. Springfield Armory just released their XDS compact .45 ACP pistol. It has an additional grip safety that makes me feel somewhat better. The size, feel and quality of this little self-defense gun are wonderful. Sit back and let delightful Dawn present this to you. I have a XDM in .45 acp 4.5" and I love it.Im a 1911 guy but when I shot the XDM I couldnt believe how soft it shoots,extremely accurate and fast trigger reset.Oh and it holds 13+1 of ALL CRIMINAL PUNISHER rounds and you can actually get your hands around it. 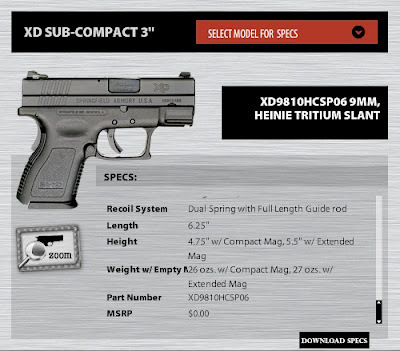 I shot the XD compact in 9mm and gound it very fast handling and accurate.Nice platform. I thought that the 45ACP must be shot from a barrel at least 4 inches long or it looses it's effectiveness. I'll stick with my Sig 245,thankyou. My Colt new Agent with its 3" barrel didnt get the memo.Simply not true.